Blue Sapphires Astrological Benefits, Zodiac birth stone blue sapphire or neelam uses, wearing blue sapphire as ring or pendant, mantra for this precious stone and latest prices of carat at Divyatattva, India. Know the benefits of wearing gemstone Blue Sapphire नीलम रत्न or Neelam, rashi ratna method of wearing, Neelam astrological benefits, precious stones according to your horoscope and how to wear Neelam birthstone by top vedic astrologers of New Delhi Shri Rohit Anand Ji. 💎Blue Sapphire Gemstone or Neelam Stone : This precious stone comes in varied colors from blue, purple, light blue gemstone and is used to enhance the beneficial powers of the Saturn in a horoscope . The quality of neelam is determined by its color, type of cutting it has and clarity which, along with carat weight, affect its value. The brightest & most costly Blue sapphires are of blue, purple and light blue and transparent in color, commands a large premium over other rubies of similar quality. 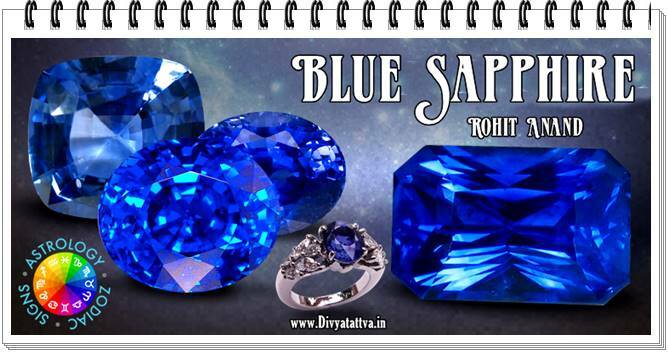 Blue Sapphire is also called by various names in India i.e. Neelam, and among nine navratnas it is one of the important Gem of the Saturn or Shani dev. Astrological Benefits of Wearing a Blue Sapphire Stone : Being basically a protective stone it helps uplift spiritually, clear thought process, removes doubts, accurate decision making , self confidence, intelligence, gives luck, wealth, prosperity and revitalize the body with energy and positivity. 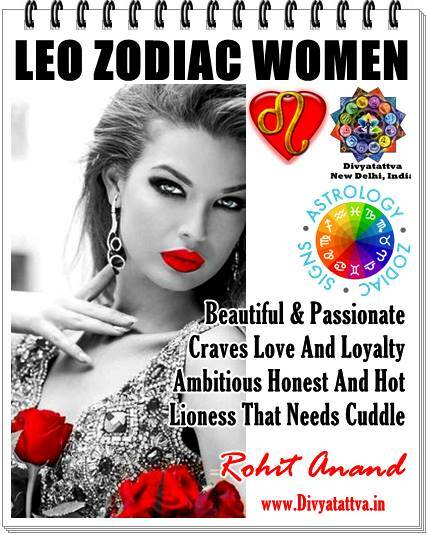 It helps in resolution of problems, enhances luck, intuition, given promotion, govt jobs, improving health and is good for those in professions like Surgeons, astrologers, doctors, scientists, writers, mechanical engineers and government personnel. Some Indian bollywood celebrities has also been seen wearing this precious stone for success in their careers i.e. Amitabh Bachchan. This gemstone can also help improve leadership qualities, enhances personality, status, strength, authority. It can also assist in achieving name, fame, position and recognition theft, terror, accidents and problems caused due to natural calamities like storms, fire etc. Therefore blue sapphire acts like a shield protecting the person from all dangers help avert the effects of black magic and evil spells too. Wearing this precious stone can remove obstacles in life, negativity, gloom, fears, phobias and gloom in life. It helps in supplementing the wearer’s income with additional wealth and creates multiple sources of income. As a result this precious jyotish stone sapphire can be depended on for achieving financial stability in home and business too. Astrology Zodiac Sign Ruler :Capricorn Aquarius. Places Found : Burma, India, Australia, Srilanka, America, Russia, Thailand, Tanzania and India. Associated Month in Western Astrology : September. Carat Recommendation : From 4 carat or ratti to 15 carat or ratti. Specific gravity: of this stone ranges between 3.99 and 4.00. Refractive index : Diverge between 1.760-1.768 and 1.770-1.779. Chakra Associated : Ajna chakra. Price Range of Blue Sapphire : From Rs. 4000 to 30000/- per carat. Neelam Recommendation : Only to be worn with strict guidance of vedic astrologer not otherwise. Wearing Neelam Ratna : Silver, Platinum, Gold or panchdhatu element is used for wearing neelam as a ring or pendant as recommended by experienced asrologist. Blue Sapphire ring can be worn in the middle finger of any hand as recommended by a competent astrologer. Astrologers also advise that neelam should be tested for 2 to 3 days before wearing it and if everything goes well during this test one can wear blue sapphire after energizing it. Usually blue sapphire can show its effects in a month after wearing it. Shani mantras which shall be recited while wearing this stone नीलम रत्न: ॐ शं शनिश्चराय नम: or "Aum Sham Shanishcharaya Namah" to be recited for 108 times. Blue Sapphire has the power to balance the highest chakra called Sahasrara chakra and Agya chakra the chakra where the Kundalini unites with the cosmic energy. Neelam Side Effects of Blue Sapphire Neelam Stone : Blue Sapphire is a stone of planet Saturn and worn with care and recommendation only. There could arise many negative consequences by wrongly wearing the neelam stone. नीलम रत्न : नीलम पहनना हमेशा सही नहीं होता है, इसलिए नीलम पहनने से पहले आप जरूर जांच-परख कर लें. 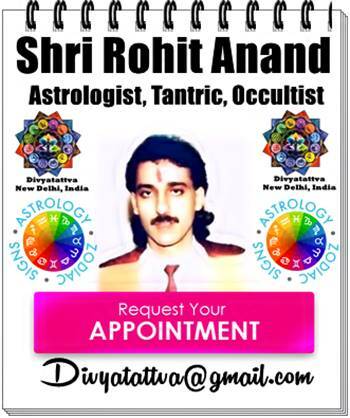 You can consult Shri Rohit Anand ji for finding out the correct gemstone to be worn by you presently that will bring out the best in you and give you success as per your horoscope and solve the problems you face in life currently. Recommendations are given by gemstone consultant for wearing lifestone, luckystone and gemstone for solving problem in the present times along with auspicious dates and time of wearing those gemstone after pooja.